Promoting child and youth participation in the work of terre des hommes and its partner organisations has resulted in the formation of a number of child and youth led-groups and initiatives at local level. At regional level a Youth Network of Southern Africa has been formed that is composed of national youth platforms from Mozambique, South Africa and Zimbabwe/Zambia, each of them linked to the programmes of TDH partner organisations in the respective countries. At each stage, elected youth network leaders are responsible for coordinating issues. The youth networks and groups are involved in various topics that are relevant to them and their peers. At partner level youths are exposed to various capacity building measures that deepen their knowledge on key topics including child participation, self organisation and advocacy. Most of the youth actions have a focus of child protection, environmental issues and its effects on the wellbeing of children, and children in the context of migration. For communication purposes, the youths make use of social media. In Zimbabwe and Zambia, the organization Citizen Child is championing and promoting the Youth Media 4 x 4 approach to promote child and youth participation. Youth groups are writing and sharing articles to advocate for children and youth issues through media, and train others to do so. The approach is planned to be replicated in Mozambique. 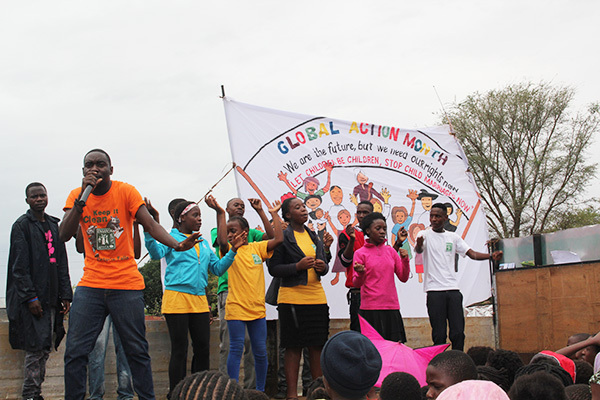 Each year in November youth from Southern Africa participate in the Global Action Month (GAM) during which youth groups linked to partner organisations of terre des hommes across the globe organise awareness campaigns or other activities to highlight issues that have a bearing on their lives.